The global human insulin market is projected to reach USD 39.13 Billion by 2020 growing at a CAGR of 8.1% from 2015 to 2020. Base year considered for the report is 2014. This research study involved the extensive use of secondary sources, directories, and databases (such as Hoovers, Bloomberg Business, Factiva, and Avention) to identify and collect information useful for this technology-based, market-oriented, and commercial study of the global human insulin market. 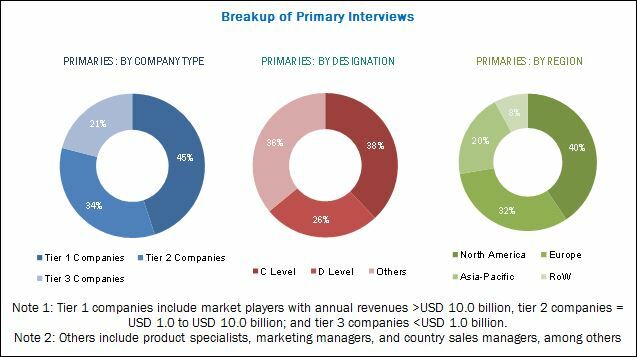 In-depth interviews were conducted with various primary respondents that mainly included key industry participants, subject-matter experts (SMEs), C & D level executives of key market players, and independent industry consultants, among others; to obtain and verify critical qualitative and quantitative information as well as to assess future market prospects of the global human insulin industry. In 2014, Novo Nordisk A/S (Denmark) dominated the global human insulin market. Over the past three years, the company adopted product commercialization, geographic expansion, and awareness campaigns as key business strategies to maintain its position in the market. The other key players in this market include Sanofi (France), Eli Lilly and Company (U.S.), Biocon Ltd. (India), Julphar (U.A.E. ), Ypsomed AG (Switzerland), Becton, Dickinson and Company (U.S.), Wockhardt Ltd. (India), B. Braun Meselgen AG (Switzerland), and Biodel Inc. (U.S.), among others. The global human insulin market is poised to reach ~USD 39.13 Billion by 2020 growing at a CAGR of 8.1% from 2015 to 2020. Market growth can be attributed to factors such as growing diabetes patient population, increasing population exposure to key risk factors leading to diabetes, rising market demand for human insulin analogs, technological advancements in the field of human insulin delivery devices, and favorable medical reimbursements. However, stringent regulatory requirements for product approval are restraining the growth of market. In addition, high product manufacturing costs is posing significant challenges for market growth. On the basis of product, the human insulin market is classified into two major segments— drugs and delivery devices. Human insulin drugs segment is expected to account for the largest share of the global market, by product, in 2015. Its large share is propelled by factors such as increasing diabetic population across globe, growing R&D for drug discovery & development, rising proportion of aging population in developed countries, increasing market accessibility of generic human insulin products worldwide, and rising government initiatives to support the development and commercialization of effective biosimilars. On the basis of product type, the human insulin delivery devices market is classified into three segments—pens, pen needles, and syringes. The pens segment is expected to account for the largest market share in 2015; it is poised to be the fastest-growing segment during the next five years. Its high growth can be attributed to growing market focus of pen manufacturers on emerging countries such as China, India, & Brazil; significant medical reimbursements offered for human insulin pens across mature markets such as the U.S. & Europe; and continuous pipeline development & product commercialization of innovative human insulin pens. Geographically, the market is classified into four regions—North America, Europe, Asia-Pacific, and the Rest of the World. In 2015, North America is estimated to dominate the global human insulin market. The Asia-Pacific market is poised to grow the fastest, during the forecast period, owing to growing diabetes prevalence in APAC (coupled with large diabetic & pre-diabetic patient population), strengthening distribution networks of global product manufacturers in the region, evolving regulatory framework for marketing approvals & medical reimbursements, continued expansion of advanced medical facilities in emerging countries (such as China & India), and rising public awareness related to benefits offered by human insulin in diabetes treatment. Geography expansion and product development are the key strategies adopted by major players to strengthen their positions in the global market. Moreover, strategies such as partnerships, agreements, collaborations, awareness campaigns, and research funding & grants were also adopted by a significant number of market players to strengthen their product portfolios and expand their distribution networks in the global human insulin market. Sanofi (France), Novo Nordisk A/S (Denmark), Eli Lilly and Company (U.S.), Biocon Ltd. (India), Julphar (U.A.E. ), Ypsomed AG (Switzerland), Becton, Dickinson and Company (U.S.), Wockhardt Ltd. (India), B. Braun Meselgen AG (Switzerland), and Biodel Inc. (U.S.) are few of the key players operating in the global human insulin market.